To reach another person on the Internet you have to type an address into your computer - a name or a number. That address has to be unique so computers know where to find each other. ICANN helps coordinate these unique identifiers, across the world. Without that coordination, we wouldn't have one global Internet. ICANN, formed in 1998, is a not-for-profit global organization dedicated to keeping the Internet secure, stable and interoperable. It promotes competition and develops policy on the Internet's unique identifiers. What is the At-Large Community? Within ICANN, the At-Large Community acts on the interests of Internet users. There are 230 At-Large Structures (ALSes) and 85 Individual Members around the world, and their numbers continue to grow. Whether it is an Internet-related consumer rights group, an academic organization, or a public-minded individual, we share a passion for furthering the development of ICTs and contributing to policies that influence the technical coordination of the Domain Name System. We work to ensure that the Internet continues to serve the global public interest. 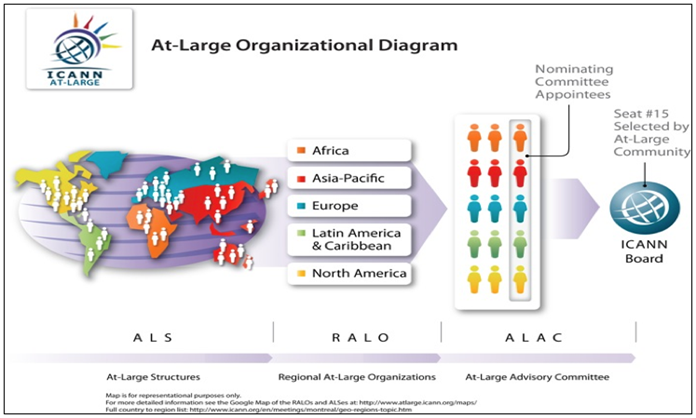 What are the Regional At-Large Organizations (RALOs)? Each RALO is governed by its own organizing documents, including a memorandum of understanding with ICANN. ​As the communication forum and coordination point, the RALOs promote and assure the participation of regional internet user communities within ICANN activities as well as enhance knowledge and capacity building. RALOs also form various Internet working groups for their ALSes and independent members in their regions to collaborate on issues ranging from policy development to Internet governance. Playing a key role in ICANN's regional strategies, several RALOs partner with ICANN's Global Stakeholder Engagement team to facilitate the development of critical infrastructure for the Domain Name System. What are the roles and responsibilities of RALOs? Within the At-Large Community's bottom-up, tiered structure, the ALAC is the primary organizational home for the voice and concerns of the individual Internet user. Representing the At-Large Community, the 15-member ALAC consists of two members selected by each of the five RALOs and five members appointed by ICANN's Nominating Committee. Advocating for the interests of end-users, the ALAC advises on the activities of ICANN, including Internet policies developed by ICANN's Supporting Organizations; it also participates in ICANN's outreach and engagement programs. In addition, the ALAC and the At-Large Community select a Director to serve on ICANN's Board of Directors. Our community offers numerous opportunities for individuals and organizations interested in engaging with ICANN. Want to gain knowledge about ICANN issues concerning end-users? We encourage you to search in the event calendar to join the RALO and ALAC teleconferences that take place monthly, or to get involved in our capacity building webinar programs. Want to influence Internet policies such as WHOIS and new gTLDs? You may learn, discuss, and debate with members in our working groups, as well as help draft policy advice on behalf of the ALAC. Have interests in areas other than strictly Internet policy? Explore the working groups in Get Involved, and you are also welcome to contribute in terms of advancing accessibility and inclusion at ICANN, testing communication and collaboration tools, and designing project proposals among other At-Large community-wide efforts. By gaining experience, you will also have the opportunity to assume positions in the RALOs, the ALAC, and other important decision-making bodies in ICANN.